I am an amateur pianist. I sit at home and try to play some of my favourite pieces of music, reminding myself that I have to put in the work and practise properly if I am ever to be able to play these pieces better. And from time to time I go to a concert, or put on a CD, to hear a professional pianist reminding me what it is that I might aim for with my playing. Sometimes I choose to listen to someone playing a piece that I have tried to play, but often I instead listen to a performance of something else that is far beyond my current reach. But hearing this inspires me to go to the piano and practise, and helps me to understand where the pieces of music that I am trying to learn fit into a bigger picture. Reading this book by Ian Stewart feels to me a bit like putting on that CD. It does not, and does not try to, give a real taste of what it is like to be a professional mathematician or indeed a maths undergraduate — the satisfaction that comes from making progress on a challenging mathematical problem, or the hard work and years of study that are required in order to understand the mathematics in depth — any more than listening to the CD sheds light on what it is like to be a professional musician. But the book does give a good picture of a selection of the topics that mathematicians study and have studied, how those topics have developed over the last two thousand years, and how they have profoundly influenced the world around us. So what is the book about? 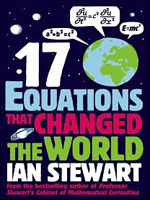 Loosely, it's about the seventeen equations that Stewart has chosen as being some of the most important. Equations ranging from Pythagoras's theorem about right-angled triangles, to the Black-Scholes equation about financial derivatives, passing via the square root of minus one, the Fourier transform, and Maxwell's equations of electromagnetism to name but a few. Each chapter starts with a single page summary. At the top is a large expression of the key equation, with each symbol annotated to explain what it means (very helpful for anyone who feels rusty about mathematical notation). And then there are brief answers to the questions "What does it tell us? ", "Why is that important? ", and "What did it lead to?''. These are then elucidated in the subsequent pages. Really the equations are just excuses to explain various interesting and important parts of mathematics and mathematical physics. Inevitably the book does not go into details, but I hope that the book will inspire some of its readers to investigate the topics in more depth. It might also prompt us to think about which equations we would have chosen, had we been making the selection. In many ways, this is a book about hindsight. Pythagoras could not have imagined the uses to which his equation would be put (if, indeed, he ever came up with the equation himself in the first place). The same applies to almost all of the equations in this book. They were studied/discovered/developed by mathematicians and mathematical physicists who were investigating subjects that fascinated them deeply, not because they imagined that two hundred years later the work would lead to electric light bulbs or GPS or the internet, but rather because they were genuinely curious. But of course these equations have been used in ways that have led to very profound advances, and Stewart describes these clearly and persuasively. Indeed, Stewart makes this point about hindsight himself, more than once, and this is a timely reminder given the current worrying trends in the funding of curiosity-driven mathematical and scientific research. Perhaps the policy makers should read this book. I have two small niggles about this book. One is that some of the pictures inside were a little disappointing: black and white pictures were not always quite up to the job. All the colour seems to have been transferred to the cover, which is a bit too garish for my taste! The other is that each chapter comes with some notes, some just providing references (to academic papers or to websites such as Wikipedia) and others giving a bit more information. The notes are often very helpful, and in some cases give more mathematical detail than most readers may want at a first reading. But the notes are all stuck in a section at the end, and I have never found a satisfactory way of dealing with this. (Do I turn to the note at the back when it is referenced in the text, and so lose my thread in the chapter, or do I wait until the end of the chapter when I have forgotten the context for the note?) Perhaps I just need to figure out how to deal with notes that come at the end of a book. I did enjoy the reference to the Wikipedia page about the cat righting reflex — Stewart reports that in between coming up with the equations for electromagnetism and so revolutionising various parts of mathematical physics, James Clerk Maxwell tried to understand how it is that a cat always lands on its feet! As with many popular maths books, this book can be read at a number of levels. For someone who knows no calculus, parts of it will be a bit obscure (despite Stewart's best efforts to make them accessible). But readers can always let the difficult bits wash over them, and there is plenty that requires much less mathematical knowledge. The book would make a great present for someone just starting to learn about calculus, for example, when they will naturally want to know why calculus is so important. It will not explain their homework for them, and nor should it (any more than my listening to a CD will help me practise my piano scales), but it will shed some light on where the topics that they are studying fit into the wider picture since so many of Stewart's selected equations involve calculus somewhere. This book offers some of the classic topics that occur in so many popular mathematics books (such as chaos), but also offers some less frequent choices and offers a new perspective on them all. Vicky Neale is a Fellow and the Director of Studies in Mathematics at Murray Edwards College, Cambridge. She tries to find time to practise the piano in between thinking about equations, and does not recommend dropping cats to see whether they land feet first. This is a delightful review and a pleasure to read. Thank you!